This is one of our most popular Christmas wreaths. Our customers tell us that they love the mixture of colors and nice forest smells. The Christmas Forest elves start with deep green evergreens and carefully form them into a perfect full circle. Next they add the pastel berries and buds from the Oregon desert. 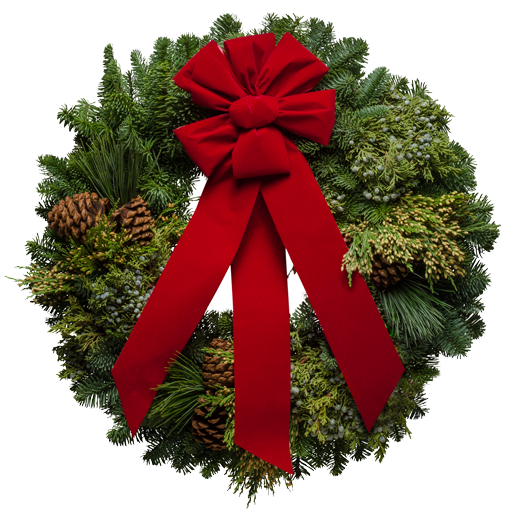 These fresh Christmas wreaths are a perfect marriage of the emerald forests and the amazingly abundant desert. Accented by a velvety red ribbon, the Cascade wreaths showcase the best of the northwest. The luxurious effect of this blend of nature cascading into a burst of color and fragrance makes this a favorite wreath year after year. It's the perfect gift for family, friends or business clients. "I just got a call from a gift recipient that received a Cascade Wreath today. She is from Utah and says that they have beautiful stuff there, but nothing like the wreath that she received - made by Julie. She wanted Julie to know that she outdid herself."